Innovalia Metrology fixturing system kit is a highly flexible, robust and wide-ranging modular construction system for small and medium parts in all industries. Innovalia Metrology fixture system is designing for all applicalions in development, tool manufacturing and prototyping. It can be assembled very quickly to increasing throughput and avoiding inspection delays. Innovalia Metrology fixlure system is designing for all applications in development, tool manufacturing and prototyping. It can be assembled very quickly to increasing throughput and avoiding inspection delays. Innovalia Metrology fixturing system kit has been designed for medium and big size parts for vertical and horizontal inspection. Every component is modular and compatible with the other components to create a multifunction and reusable fixture solution in every industry. 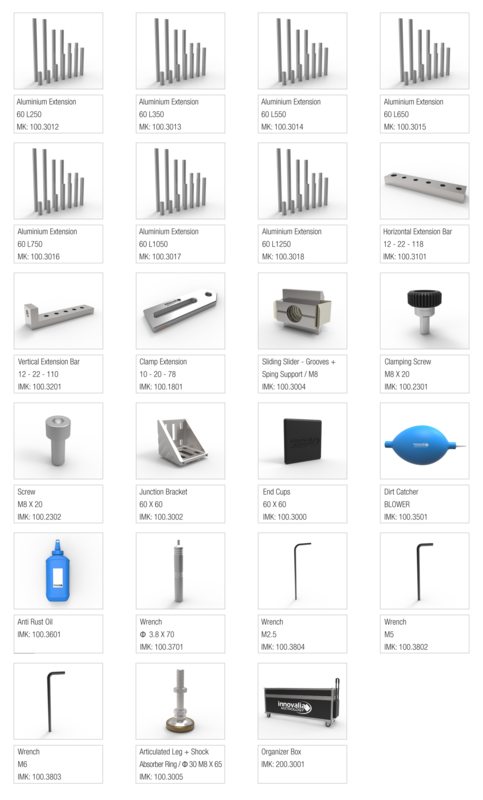 Innovaia Metrology fixture system is designing for all applicalions in development, tool manufacturing and prototyping. It can be assembled very quickiy to increasing throughput and avoiding inspection delays.